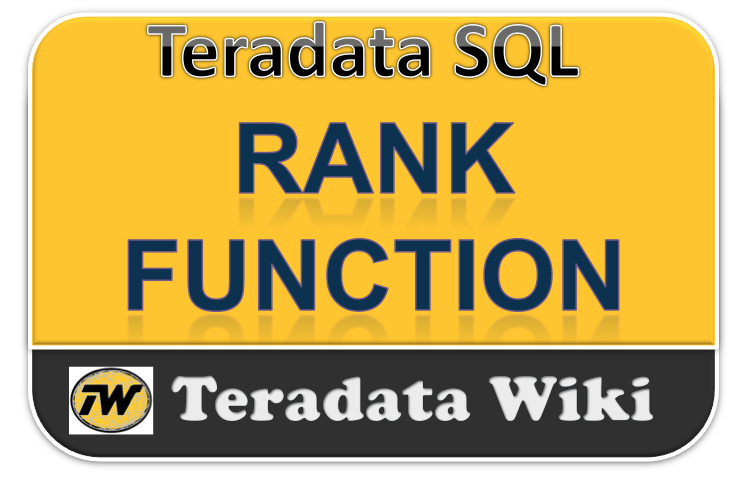 The teradata RANK function permits a column to be ranked, either based on high or low order, against other rows in the answer set. You may specify the order of ranking by use of the ORDER BY clause within the RANK function. Descending order will provide traditional ranking wherein the largest value is assigned a rank of one. Ascending order will associate the largest value with the highest rank value (i.e., typically a value > 1). Show the ranking of product sales for store 1001.
,RANK( ) OVER (ORDER BY sales DESC) AS "Rank"
WHERE clause qualifies rows to be ranked. Show the lowest ranking of product sales for store 1001.
,RANK( ) OVER (ORDER BY sales ASC) AS "Rank"
Rank #1 always appears at top of list unless overridden. The QUALIFY clause allows restriction of which rankings will be output in the final result. QUALIFY performs like the HAVING clause by requesting a specific range in the output. QUALIFY shows the ranking for the top 3 sales amounts only. The RANK function produces an ordered sequence. ORDER BY can override the normal sequencing. Reverse the ranking sequence in the previous example. ,RANK( ) OVER (ORDER BY sales DESC) AS "Ranking"
The ORDER BY clause in the SELECT statement may always be used to control the final order of the result set. After the ranking is applied, the output results are produced based on the ORDER BY sequence in the SELECT statement, if specified. The PARTITION BY clause may be used in conjunction with a RANK function to change the scope of the ranking. Without a PARTITION BY clause, the scope defaults to the RANK column. Whereas the RANK( ) ORDER BY clause controls the default sort key, the PARTITION BY clause adds another level of sort to the output. Get the top three selling products in each store. ORDER BY sales DESC) AS "Ranking"
PARTITION BY clause controls scope, i.e., rank sales within store. Without PARTITION BY, scope would default to sales only. QUALIFY the ranking for the top 3 sales amounts per store. Sort sequence of output is sales descending. Due to PARTITION BY, sort is by sales (DESC) within store (ASC). Note -- no aggregation is done in this query. I always had tough time understanding this.. Thanks for the explanation.. Very well explained, and good examples. Thank you!